The Board of Directors primary responsibilities are to maintain and preserve the collections of the museum, to raise funds and to expand access to its resources, and to raise the museum’s national and international reputation. 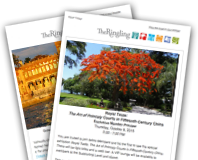 The Ringling Annual Review provides a comprehensive overview of the Museum’s important achievements during the fiscal year. Please enjoy reading highlights of our exceptional exhibitions, educational programming and recent acquisitions. The Ringling Staff is dedicated to the institution and inspired by its mission. Here you will find the important information you may need to contact various departments at The Ringling.